Many thanks to my former next door neighbor (and still neighbor to my mom and sister) for sending me this poem on hoeing. He is the one who planted the trees that I wrote about early in July. His son heard the poem and sent it to him, and he sent it to me. 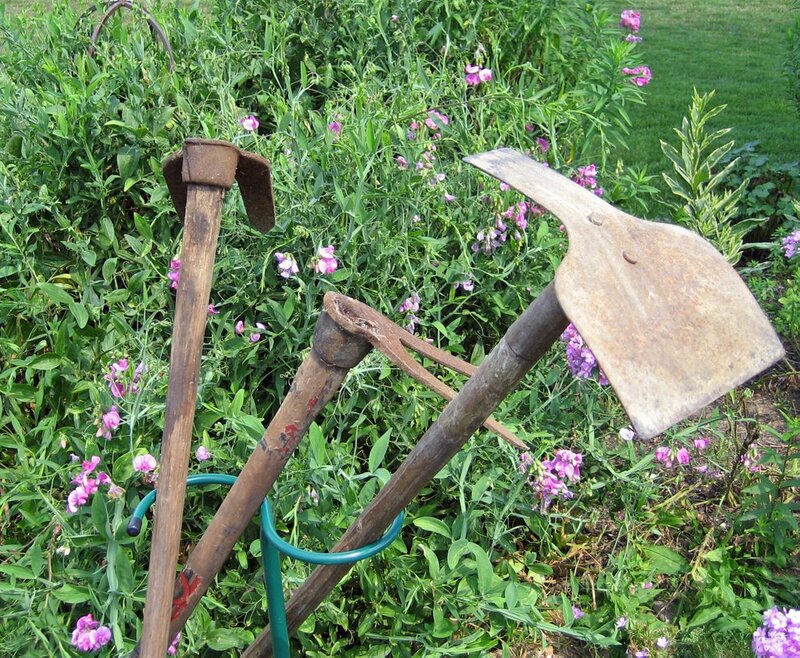 Many thanks to the colleague at work who helped me acquire these new-to-me old hoes to add to my hoe collection. Many thanks that I have not been deprived of the pleasures of hoeing! Just how many hoes do you have! I'll admit I may have a few more hoes than are probably absolutely necessary to garden. Some are good, some not so good, some are old, some are new. I think you're avoiding answering the question! Carol - How funny, but I heard this John Updike essay/poem on hoeing on NPR this morning - and I thought that I should find it for you! So I googled it and this post showed up. I should have known! I had never heard the passage before - how perfect it is! has never performed this simple, stupid, and useful wonder."